Drink, lessons on storing and laying wine down! Beautiful wine cellar, no it is not mine, wishful thinking. Before moving into a condo I had a self-made cellar in my home. Being in the wine industry for many years I collected many fine and rare bottles. Most wine makers now make wine to be consumed within three to four years after release. Of course we are not talking about some high end Bordeaux or Burgundy, or Napa Valley Cabernet Sauvignon. Some of these bottles including many port’s can be laid down for 20 plus years. Wine is a living thing which means you need to store it properly. Keep bottle’s laying on their side so the cork stay’s wet. Try and keep in a dark area, (closet) no sunlight, and no vibration. 64 degrees is a good temperature with good humidity. At one point I had way over 600 bottles, yeah sounds nice. I did have each bottle labeled separated by grape varietal, region and vintage. What I did not do was write in a journal or do an inventory online. In which now I would highly suggest. You do not need to have hundreds or thousands of bottle’s to do this. Even fifty or more bottle’s really would be a good idea. Over the past few year’s I have lost more bottle’s than I would like to admit to. Why? One of those thing’s, no let’s not open that tonight, to expensive, or not the right evening, or oh that’s a great wine to open casually, we need a special night for that one. Yes, it happens and I have seen many people with so much money where they have these huge beautiful wine cellars basically to impress people. Of course not all, but once I walked into a friend’s cellar and more than half the bottle’s he had were past their prime. Lesson learned. Now I do not have room to store more than 200 bottle’s but even now I am keeping a journal as to when I need to drink each bottle. Before a certain year to get it at its prime. You can go to the winery website or read reviews and most of the time it will tell you when you should drink by. Suggestion: winery, Robert Parker, or Wine Spectator. It is so sad when you open an awesome bottle to have it turn to vinegar or have a foul smell, with all the fruit gone, and color. Have fun, drink away, wine is meant to be shared and savored. 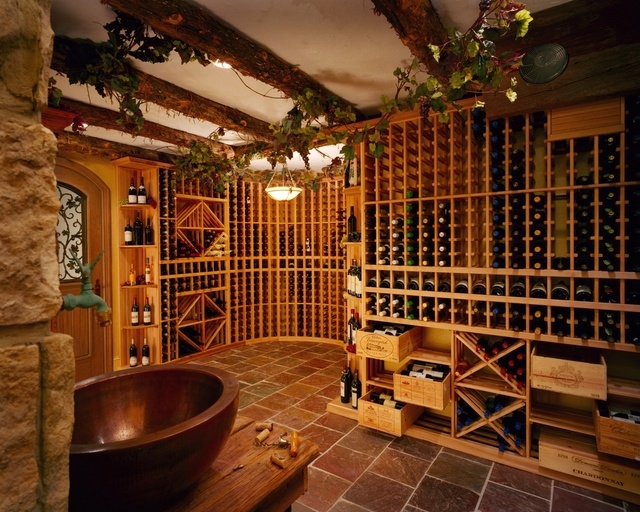 This entry was posted in Educational Tools and tagged cellar, humidity, proper temperatures for wine, Robert Parker, wine prime, Wine Spectator, wine storing, winery. Bookmark the permalink. 6 Responses to Drink, lessons on storing and laying wine down! This is the blog I wanted to read. How often would you say you open an aged bottle, and find it past its prime? I think it helps to have an understanding of *why* you want to age that particular wine. With beer, I like having one beer to drink fresh and one to age……I know that with some of those expensive Cabs, that may not be an option 😉 But if you can manage that, I think it gives you a better idea of what you can hope to get from aging, and sometimes yields clues as to how long it might go for. Sometimes I find that I don’t really want to age the bottle at all, that it’s drinking perfectly while fresh. For example, I age Sierra Nevada Bigfoot because it’s relatively cheap and fairly easy to get – it’s supposed to be this awesome aging beer……..but so far, I’ve found that I like it better when it’s all bright and fresh. It’d be a shame to spend a lot of money on a wine, wait 10 years and find that it’s not so great, that maybe you should have only waited 5 years, if that. Hey thanks for the comment. Yes I forgot to say I usually always buy more than one bottle and drink one within a short time after purchase. In the wine world it’s different I guess from the beer world. You know how long typically it will age by the complexity, fruit, density, body, finish, and for me how hot and young it might be. Example when you open a high end young Cabernet Sauvignon or Super Tuscan, Barolo, or Burgundy for instance you can only taste the alcohol this is what we call HOT, can’t taste any fruit, no real structure yet or layers. At this point you know you need to lay it down fir years and tears and it will only get better. Prove oh gee I should not type from my phone. Also I forgot to mention the tannins, hence those are what make you pucker. When a wine is very young, not ready to drink quite yet the tannins are firm. Pretty similar. We look for beers that are too hot while young too. The tannins make sense. Have you ever opened up a bottle of wine that you figured on aging for a long time, and think, wow, this is just fine fresh? Oh cool, yes actually I have several. Sometimes I like firm chewy tannins so for me it’s usually about the mood I am in, company I’m with and what I might be eating. Usually a steak, then I like a big bold young wine to hold up against it.